Buying a diamond is an exhilarating and very personal experience that is enriched when you enjoy exceptional value and quality for your investment. Following these simple steps will ensure that you make more confident and informed decisions during your upcoming diamond purchase. Diamonds vary widely in size, quality, shape and price. The amount of choices can be daunting and it is easy to get carried away without a point of reference. Accordingly, it is important to establish a budget before you start looking for one. Only you can determine what price range is most comfortable for you. Deciding that at the outset of your search will save you time and enable you to focus on getting the best quality and value for your budget. Though Round diamonds account for the majority of sales today, diamonds come in a variety of dazzling shapes to meet any personal taste and preference. With diamonds, remember that shape is not the same as cut. Shape refers to the physical contour of the stone. Cut dictates the diamond's overall proportion and how it reacts to light. A diamond's sparkling character and reflective brilliance increases in proportion to the fineness of its cut. Over the years, diamond professionals have developed standards for comparing and evaluating the quality and value of diamonds. Known as the 4C's, these standards are Carat weight, Color, Clarity and Cut. The balance of these characteristics within the stone greatly affects a diamond's appearance and value. Diamonds generally increase in value as their color moves from pale yellow to an absence of color that promotes more reflection and dispersal of light. A finer cut brings out more brilliance and fire. Clarity improves when diamonds contain less of the impurities that are embedded in the stones during their formation. When weighing diamonds, we use a unit of measurement called a carat. One carat (1.00 ct) equals 200 milligrams, or 0.200 grams. Finding the best diamond for any occasion is generally a matter of knowing your budget, desired diamond shape and which of the 4C's matters most to you. In addition, it can be helpful to consider other diamond characteristics, such as Polish, Symmetry, Depth & Table percentage, and Length-to-Width Ratio; standard features gemologists examine when grading diamonds. These secondary characteristics can factor in the quality and value of a diamond and can thus be helpful in your decision. Shape is always a significant consideration when shopping for any diamond. While the 4C's are extremely important, the shape of the stone will have a major impact on a diamond's appearance and how much it is enjoyed by the recipient. People often confuse a diamond's shape with its cut and the two characteristics are frequently listed side-by-side. For example, a "Round Brilliant" diamond is one with a Round shaped diamond with a Brilliant cut style. Whereas shape refers to the physical form and contour of the diamond, the quality of its cut dictates overall proportion and how it reacts to light. A diamond's sparkling character and reflective brilliance increases in proportion to the fineness of its cut. In addition to ever-popular Round diamonds, there are a variety of other shapes available to appeal to any taste and preference. These latter shapes are collectively referred to as "fancy cut" diamonds. Round diamonds are perennially popular and account for a majority of sales today. Round brilliant-cut diamonds, with their 58 facets and 360-degree symmetrical shape, are the most optically brilliant diamonds. Also very popular, Princess diamonds are the perfect choice for those seeking a square or rectangular stone offering the brilliance of a Round diamond. If you prefer a square-shaped Princess diamond, choose a length-to-width ratio between 1 and 1.05. For a quality rectangular shaped Princess diamond, look for a length-to-width ratio greater than 1.10. The Marquise shape takes its name from the legend of the Sun King who desired a stone polished into the shape of the mouth of the Marquise of Pompadour. The elongated diamond gives the illusion of greater size while accentuating long, slender fingers. Diamonds with a classic Marquise shape usually have a length-to-width ratio between 1.75 and 2.25. Emerald diamonds have long facets, layered corners that resemble stairs and a cut that highlights clarity better than any other shape of diamond. If you prefer an Emerald cut with a square outline, look for an Asscher-cut diamond. For a classical Emerald shape, look for a length-to-width ratio between 1.30 and 1.50. Blocked corners are the signature trait of Radiant shape diamonds. They combine the glamour of a classic Emerald stone with the brilliance and fire of a Round-cut diamond. If you prefer a square shaped Radiant diamond, look for a length-to-width ratio between 1 and 1.05. If you prefer a rectangular shape, the length-to-width ratio should be greater than 1.10. Resembling an elegant teardrop, Pear diamonds are a stylish combination of Round and Marquise shaped stones. Their unique shape allows them to easily be cut to accommodate profiles that are fatter and longer. A classical Pear shaped diamond has a length-to-width ratio between 1.45 and 1.75. Oval diamonds offer the sparkle of round stone in an alluring and elongated silhouette. They are the ideal choice for those who want a unique shaped diamond that accentuates long, slender fingers. Classical oval shape diamonds have a length-to-width ratio between 1.33 and 1.66. Heart diamonds offer brilliance and symmetry in a shape that is a timeless symbol of romance. The lobes of a Heart stone should be rounded - not pointed - and clearly defined. As with Pear-cut stones, the cut of Heart diamonds can be fatter and longer per your preference. A wider Heart shape will have a length-to-width ratio between 0.85 and 1.00. For a longer, tapered design, try a length-to-width ratio between 1.00 and 1.10. A variation of the classic Emerald shape, Asscher diamonds have deeply trimmed corners and a thick profile within a square frame. A classical Asscher shape has a length-to-width ratio close to 1.00. If you prefer an Asscher-cut style with a more rectangular outline, look for an Emerald-cut stone. Cushion shaped stones have a square-rectangular cut with rounded corners and large facets that enhance brilliance. Those seeking a square shaped Cushion diamond should look for length-to-width ratio between 1 and 1.05. For a rectangular shaped Cushion, try a length-to-width ratio between 1.10 and 1.20. BUYER'S TIPS - Which Shape should you choose? There are many shapes of diamonds to choose from and their attractiveness ultimately depends on the personal preference of the wearer. It is always a good idea to get a sense of preferred diamond shape before buying a stone for that special someone. The above listed shapes refer to the most commonly used diamond names. Some of these shape names are trademarked. Accordingly, diamond laboratories sometimes use different names in order to respect branding restrictions. For example, Princess-cut diamonds are sometimes called Square Modified Brilliant and Asscher-cut stones are also known as Square Emerald-cut. A carat is the standard unit of measurement used to weigh diamond and gemstones. One carat (1.00 ct) equals 200 milligrams, or 0.200 grams. You may also have heard jewelers talking about "points". In common jewelry parlance, when referring to a diamond weighing less than one carat, jewelers use points, just like pennies are used for prices lower than one dollar. A point equals 0.01 ct. So, for example, a 15 point diamond is the same as a 0.15 ct diamond. As large diamonds are rare, they have a greater value per carat and the price of diamonds rises exponentially in relation to size. Accordingly, a one carat diamond with a certain color and clarity will be much more valuable than two separate half carat diamonds of the same quality. Due to higher demand, diamonds increase in value after they reach the half and full carat mark. It is a common misconception that a half-carat diamond is half the size of a one-carat diamond. While a half-carat diamond is half the weight of a one-carat diamond, the size difference in Round stones is only 1.35mm. The average measurements for a half-carat diamond and a one-carat stone are 5.00mm and 6.35mm, respectively. While the size of the diamond significantly affects its price, it does not guarantee beauty. Before you buy a diamond, it is best to first make a decision about preferred quality and then choose the size of diamond that you can afford in that quality range. If you prefer a 1.00 ct diamond but are limited by your budget, consider a 0.90 ct one. Size difference between 0.90 ct and 1.00 ct diamonds is only very slight — even imperceptible to the untrained eye. A well-crafted 0.90 ct will comparatively have more sparkle, fire and brilliance than a 1 ct one for the same price or even less. This same argument also applies to other diamonds of comparative size ratios. Diamonds generally increase in value as their color moves from pale yellow to an absence of color that promotes more reflection and dispersal of light. Even the slightest tinge of yellow or brown in a white diamond will decrease its value. White diamonds are graded on a scale that uses the letters of the alphabet to describe color ranging from D (colorless) to Z (light yellow or brown). Absolutely colorless. This is the highest color grade and these diamonds are extremely rare. Colorless. These are rare diamonds that contain only minute traces of color as detected by a gemologist. Colorless. Still considered colorless grade, these high-quality diamonds have only a slight color as detected by a gemologist. Near colorless. These diamonds offer an excellent value and their color is mostly noticeable when compared to diamonds with better grades. Near colorless. These diamonds offer an excellent value and their color is noticeable when compared to diamonds with better grades. Near colorless. Color slightly detectable. An excellent value. Yellowish tint. This color does not show with smaller diamonds when they are mounted, but diamonds of half carat or more will show noticeable color to the untrained eye. Yellow. These diamonds show increasing yellow or brownish tints and they are very off-white in color. Fluorescence is a property of some diamonds to emit visible light when expose to invisible ultraviolet radiation. Fluorescence is detected by gemologist using special long wave and short wave ultraviolet lamp, and can manifest itself in daylight and some artificial lighting giving the diamond a bluish or milky appearance. Though fluorescence lowers the value of a diamond, it can make it appear whiter and closer to colorless. Blue fluorescent coloring can actually improve the color of a diamond by a grade or two while lowering its value. Fluorescence occurs in varying degrees of color from a common blue to a rare yellow. Fluorescence is graded from None to Very Strong. BUYER'S TIPS - Which Color should you choose? When it comes to diamonds, most people find it very difficult (if not impossible) to tell the difference from one color grade to another. Despite this, color has a significant impact on the price of diamonds. Though purists prefer diamonds in the D to F range, you can find tremendous value and a colorless look by selecting diamonds in the G to I range. If you are shopping on a budget or trying to maximize the size of your stone, consider J diamonds that combine affordability with near colorlessness. Medium or strong fluorescence actually counteracts the slight yellow body color of diamonds that are rated I color or lower. As a result, these diamonds appear to be more white or colorless than they actually are. This gives the budget-conscious buyer the opportunity to purchase a lower-color but whiter-looking diamond that offers an appearance that is comparable to a more expensive, higher color diamond. Size How large or small the inclusion is within the diamond. Number How many inclusions are found within the diamond. Position The location of the inclusions within the diamond. Inclusions located under the table or "heart" of the diamond (the upper flat facet of the stone) impact the clarity grade more than inclusions located under the side facets. Nature The degree to which the inclusions affect the durability of a diamond. Large feathers (miniscule fissures) in a diamond can be hazardous depending on their size and position. Relief The degree to which the inclusion is visible. Dark inclusions are easier to locate than white or clear inclusions and may be graded more harshly. No inclusions or blemishes are visible under 10x magnification. These diamonds are very rare, beautiful and expensive. Inclusions and blemishes are very difficult to see under 10x magnification. These are excellent quality diamonds. Inclusions are not typically visible to the unaided eye. VS1-VS2 diamonds contain minor inclusions that range from difficult to somewhat easy to see under 10x magnification. Though less expensive than VVS1-2 stones, these are excellent quality diamonds. Inclusions are easily visible under 10x magnification and may be visible with the unaided eye. These diamonds still offer a great value at a much less cost than those with higher clarity ratings. Inclusions are visible to the unaided eye and in some cases affects the durability of the diamond. It is always a good idea to balance the clarity grade of your diamond with its color. If you are interested in diamonds in the D-F color range, focus on clarity grades of VS2 or higher. For excellent value, look for G-I color range diamonds with SI clarity. Referring to the pattern of angled facets on the surface of the diamond, the cut of a diamond determines its brilliance and fire. People often confuse a diamond's cut with its shape. Whereas shape refers to the physical form and contour of the diamond, the quality of its cut dictates overall proportion and how it reacts to light. A diamond's sparkling character and reflective brilliance increases in proportion to the fineness of its cut. The cut of a diamond includes considerations like symmetry, depth, crown and pavilion angles, uniformity of facets, quality of polish and the overall skill of the cutter that sculpted the stone. Most gemologists consider cut to be the most important diamond characteristic. A poor cut will dull the brilliance of a diamond of perfect color and clarity. Diamond Brilliant cut: Brilliant-cut is a specific diamond cutting style developed to maximize a diamond's optical properties. A Brilliant-cut diamond can have several shapes: Round, Princess, Marquise, Radiant, Pear, Oval, Heart and Cushion. A Brilliant-cut diamond that is well-cut, highly polished and well-balanced in proportion will give you that stunning fire, brilliance and sparkle you're looking for. Cut is the most difficult characteristic of a diamond to grade because it is based on a combination of aspects. These include crown depth, crown angle, pavilion depth, pavilion angle, the symmetrical arrangement of facets, polish - and more. Since the perfect balance of each is difficult to determine, the variance in the proportions between an Ideal Cut and a Poor Cut can be difficult to discern. Accordingly, the industry developed Diamond Cut Grading Standards to help in determining the quality of a diamond's cut. The cut grade only applies to Round diamonds because they were the focus of the initial research conducted by cut grading laboratories. Though grading laboratories are slowly introducing cut grades for the fancy shapes like the Princess, Emerald, Oval, Radiant, Cushion and others, fancy shape diamonds with a laboratory cut grading remain rare. Each diamond shape has its own set of cut parameters that produce the optimal light performance and beauty for that particular shape. Perfectly proportioned and offering the highest grade of polish and symmetry, these stones reflect virtually all light. These diamonds are the most brilliant, rare and finest money can buy. Usually cut to maximize the size of the diamond, a Very Good Cut stone falls a little short of the ideal diamond proportions. A Very Good Cut Diamond reflects most of the light that enters the stone to provide a high level of brilliance. When a cutter chooses to create the largest possible diamond from a rough crystal, the proportions of the stone are beyond the ideal range. Much of the light that enters the stone is reflected back to deliver a good sparkle. This type of cut grade is an ideal choice for shoppers who want to stay in budget without sacrificing quality or beauty. These stones are cut to maximize carat weight over other considerations. A diamond in this grade will reflect only a small proportion of the light that enters into it. Polish refers to the overall smoothness of a diamond's surface. Polish grades indicate how visible the polishing marks (blemishes that are not significant enough to affect the clarity grade of the diamond) are on the facets of the diamond. Though polish marks are almost always invisible to the unaided eye, they have a slight effect on the diamond's overall brilliance. Examples of blemishes that might be considered polish marks include faint polishing lines and small surface nicks or scratches. These marks are caused by microscopic diamond crystals that are pulled across the facet of the diamond by the polishing wheel during the cutting process. Ideal Polish lines or marks are extremely difficult to locate under 10x magnification. Excellent Polish lines or marks are very difficult to locate under 10x magnification. Very Good Polish lines or marks are difficult to locate under 10x magnification. Good Polish lines or marks are relatively easy to see under 10x magnification, but remain invisible or extremely difficult to see with the unaided eye. Fair Polish lines or marks are obvious under 10x magnification, but remain difficult to see with the unaided eye. Poor Polish lines or marks are easy to see without magnification. BUYER'S TIPS - Which Polish should you choose? Consider choosing a diamond with a Good polish grade. While diamonds with higher polish grades are desirable, there are fewer of them. Accordingly, they are generally more expensive than Good rated diamonds despite the fact that they are not noticeably better when viewed with the unaided eye. Be careful when buying diamonds with polish grades of Fair or Poor. The quality of their polish may limit the brilliance of the diamond. Symmetry refers to the appropriateness of the diamond's shape and facet arrangement. Brilliance is diminished as a result of symmetry flaws such as variation in shape, alignment and the placement of diamond's facets in relation to one another. Symmetry grades indicate how visible these symmetry flaws are in the diamond. Major symmetry flaws are often seen in diamonds that are graded as Fair or Poor. These flaws can include severe misalignment of facets, a noticeably off-center table, a noticeably off-center culet, a noticeably 'wavy' girdle, or a table which is noticeably not parallel to the girdle. Ideal Misshapen or misaligned facets are extremely difficult to locate under 10x magnification. Excellent Misshapen or misaligned facets are very difficult to locate under 10x magnification. Very Good Misshapen or misaligned facets are difficult to locate under 10x magnification. Good Misshapen or misaligned facets are relatively easy to see under 10x magnification, though invisible or extremely difficult to see with the unaided eye. Fair Misshapen or misaligned facets are obvious under 10x magnification and difficult to see with the unaided eye. Poor Misshapen or misaligned facets are easy to see without magnification. 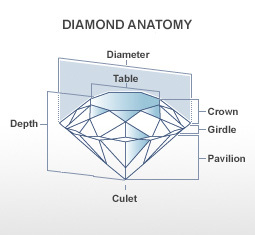 The placement of the table (the largest facet on a diamond) should be centered at the top of the stone and needs to be parallel to the girdle. If the table is off-center or not parallel with the girdle this can cause uneven crown angles from one side to the other. In this example we see the unbalanced appearance that occurs from an off-center table. To check if the culet is centered, look at the diamond in the face-up position. You'll see the lower girdle facets through the table. If the lines formed by them look like a perfect square, the culet is centered. If the cross bends one way or the other, the culet is not centered. In this example we see what an off-centered culet might look like. Here we see another example of what occurs when the table is not parallel with the girdle. As you see, the crown angle is much more steep on one side versus the other. From the top view you may have noticed an off-center table. BUYER'S TIPS - Which Symmetry should you choose? Consider choosing a diamond with a Good symmetry grade. While diamonds with higher symmetry grades are desirable, there are fewer of them. Accordingly, they are generally more expensive than Good rated diamonds despite the fact that they are not noticeably better when viewed with the unaided eye. Be careful when buying diamonds with symmetry grades of Fair or Poor, The quality of their symmetry may affect the brilliance of the diamond. Diamond laboratories are objective third-parties that independently grade diamonds and produce diamond certificates. Also known as a "diamond grading report", a diamond certificate is a document in which a gemologist describes the physical characteristics of diamonds and assigns them standardized grades for characteristics such as cut, color, clarity, polish, symmetry and others. BUYER'S TIPS - Which Lab should you choose? As an independent assessment of a diamond's quality, a diamond certificate is an important tool that can help you to make a good purchasing decision. Depth percentage is an expression of how deep a diamond is. It is determined by dividing the height of the diamond (measured from the table to the culet) by its diameter. Each diamond shape has its own range of ideal depth percentages. The table percentage is measured by dividing the width of the diamond table by its diameter. Since depth and table percentage has a major impact on a diamond's brilliance, gemologists consider these important characteristics when evaluating a diamond's cut. The length-to-width ratio of a diamond indicates how square or rectangular the diamond is when viewed from the top. This ratio applies to all diamond shapes except Round diamonds. Since length-to-width ratio has a major impact on a diamond's beauty, gemologists consider it an important characteristic when evaluating a diamond's cut. If you prefer a square-shaped Princess diamond, choose a length-to-width ratio between 1 and 1.05. For a quality rectangular shaped Princess diamond, look for a length-to-width ratio greater than 1.10. Diamonds with a classic Marquise shape usually have a length-to-width ratio between 1.75 and 2.25. If you prefer an Emerald cut with a square outline, look for an Asscher-cut diamond. For a classical Emerald shape, look for a length-to-width ratio between 1.30 and 1.50. If you prefer a square shaped Radiant diamond, look for a length-to-width ratio between 1 and 1.05. If you prefer a rectangular shape, the length-to-width ratio should be greater than 1.10. A classical Pear shaped diamond has a length-to-width ratio between 1.45 and 1.75. Classical oval shape diamonds have a length-to-width ratio between 1.33 and 1.66. A wider Heart shape will have a length-to-width ratio between 0.85 and 1.00. For a longer, tapered design, try a length-to-width ratio between 1.00 and 1.10. A classical Asscher shape has a length-to-width ratio close to 1.00. If you prefer an Asscher-cut style with a more rectangular outline, look for an Emerald-cut stone. Those seeking a square shaped Cushion diamond should look for length-to-width ratio between 1 and 1.05. For a rectangular shaped Cushion, try a length-to-width ratio between 1.10 and 1.20. For additional information or help in choosing the perfect diamond for an engagement ring, or for assistance in choosing a wedding ring, eternity ring, or special occasion ring, call now to speak to one of the Mark & Gordon Gendron diamond experts at 4016261057.